At this month’s Emerald City Comic Con, fans not only had the chance to see the stars of Boy Meets World and Stanger Things, but for the first time they had the opportunity to attend a panel presented by National Geographic. Since its founding in 1888 National Geographic has been trying to expand our knowledge of the world around us. In 1975 they launched the program that would become National Geographic Kids, and now 130 years later, they set out to engage the next generation in a whole new way. In September 2018, Under the Stars, the company’s latest division released Explorer Academy: The Nebula Secret, their first in a series of fact-based fiction titles targeting kids between the ages of 8 and 12. The series will follow 12-year-old Cruz Coronado as he leaves behind his home in Hawaii to attend the prestigious Explorer Academy. Along with meeting his new classmates, Cruz will be challenged like never before as he trains to become part of the next generation of explorers. If the course load wasn’t enough, Cruz has become the target of the shadowy organization Nebula. What do they want with him and what does it have to do with the death of his mother 7 years ago? To save himself Cruz will have to unravel the greatest mystery he had ever come across, the secret of what his mother was working on when she died, and if her death was indeed an accident. National Geographic chose writer Trudi Trueit to pen the 7-book Explorer Academy series. Trudi has a mix of over 100 nonfiction and fiction titles on her bibliography and perfectly blends the realistic with the fictional. Joining Trudi is illustrator Scott Plumbe who fills each book with beautiful artwork that is either original or inspired by images from the pages of National Geographic. The third member of the team is code master Dr. Gareth Moore who helps design the puzzles that Cruz and the readers must solve. The trio has already earned praise from the likes of deep-sea enthusiast and director, James Cameron, and Star Trek director J.J. Abrams. 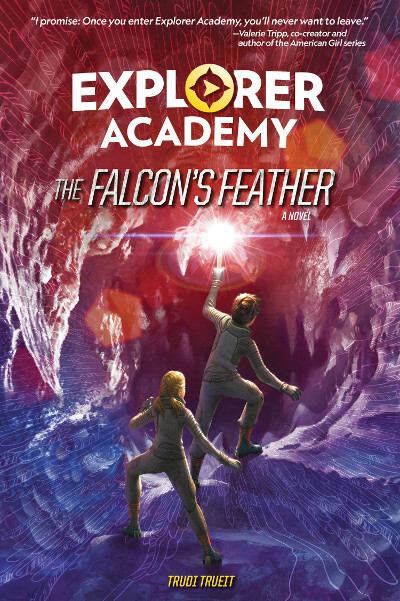 The Second book in the series, Explorer Academy: The Falcon’s Feather was released last week and is available for $16.99. While book one, The Nebula Secret, can be found online for less than $10. A new book will be released every six months. The first hit stores in September of 2018 and the final book is scheduled for September 2021. This release plan will work perfectly for readers on the lower end of their target audience of 8-12-year-olds. Kids who start a little older should have enough investment between the books and the additional activities on ExplorerAcademy.com to stick with the series until Cruz breaks the final code. After the panel, I was lucky enough to speak with Trudi and National Geographic explorer Erika Bergman about the background of the series and how it is inspired by Erika and her fellow explorers. They are a passionate duo who believe in the series and National Geographic’s goal to inspire the next generation to explore the world near and far. You can listen to our conversation below.